ANIMAL WILDLIFE | Tapir | tapir endangered, baird s tapir, tapir conservation, adopt a tapir - The tapir is a large mammal that despite it's pig-like appearance, is believed to be most closely related to horses and rhinos. 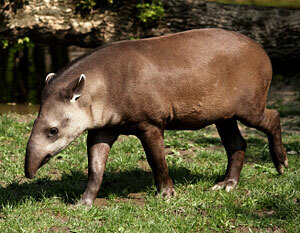 The tapir is found in moist, dense forests in the more temperate regions of the Southern Hemisphere. 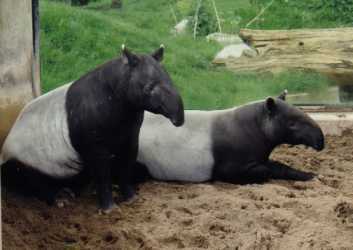 There are four known species of tapir today, all of which are classified as endangered. The different species of tapir are the Baird's Tapir which is native to Central America and the northern parts of South America. The Baird's Tapir can be identified by the fact that this species of tapir has a cream coloured marking on it's face. The Malayan Tapir (also known as the Asian Tapir) is the largest of the tapir species and has a distinctive white band across it's body. 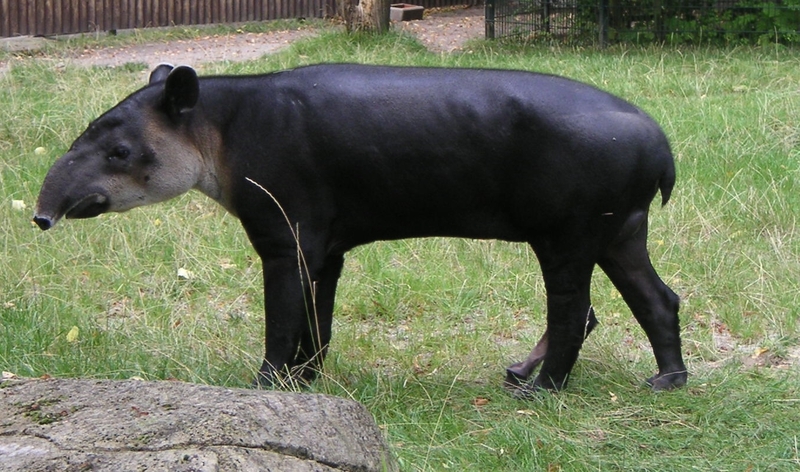 The Malayan Tapir once roamed the tropical forests across South East Asia but the Malayan Tapir today has a much smaller range primarily due to habitat loss. The Mountain Tapir is the smallest of the four different tapir species and (as the name suggests) it inhabits more mountainous regions rather than lowland forests. The Mountain Tapir is found in the high forests in the Andes mountains across Colombia, Ecuador and parts north of Peru. The Brazilian Tapir (also known as the South American Tapir) is known to be a fantastic swimmer and the Brazilian Tapir is generally found close to water in the Amazon Rainforest. 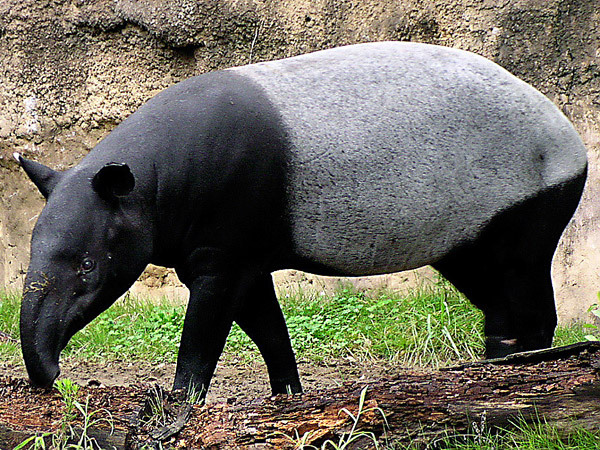 The tapir is a herbivore and spends it's time browsing for food to eat. The tapir eats leaves, twigs, branches, buds, shoots, berries, fruits and aquatic plants. 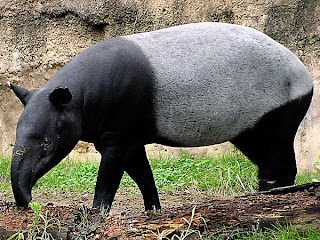 Due to it's large size, the tapir has few natural predators in it's environment but it is known to be prey upon by wild cats such as tigers, jaguars and cougars along with large reptiles like crocodiles and even the odd snake. The human is believed to be the most common predator of the tapir as they have been hunted for food and even domesticated in some areas. Tapirs have a long, flexible nose (similar to the trunk of an elephant but no way near as big). The tapir uses it's prehensile snout to grab leaves and branches from bushes and low trees. Despite, their stocky build, tapirs are known to be fantastic swimmers and tapirs therefore spend a great deal of their time close to water which the tapirs use to cool down. Tapirs are even known to dive into the shallows in order to feed on the lush aquatic plants. Tapirs tend to mate in the cooler months of April and May. After a gestation period of more than a year, the female tapir gives births to just one tapir baby. When the baby tapir is first born, it weighs around 10 kg and the baby tapirs also have a stripy coat particularly in comparison to the adult tapirs. Female tapirs are thought to breed every other year, and the baby tapirs tend to leave their mother when they are between 2 and 3 years old. Today, all four species of tapir are considered to be endangered. This is mainly due to do deforestation and habitat loss, and over hunting of tapirs by humans. Humans have hunted tapirs for both their meat and their leathery skin. I hear the tapir loses it's pajama-like fur around its third birthday. Given all this, is it okay to eat tapirs? 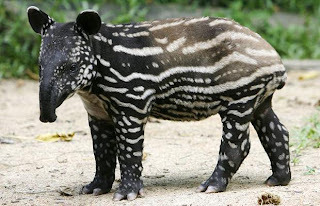 May I use the first tapir picture as a stock image for my photo manipulation? Very nice picture! I like all picture.